This post enlists some of the economic benefits of ewaste recycling process. The e-waste comprises of computers, laptops, televisions and mobile phones most of which are easily processed for reuse. Every year more than 50 metric tons worth e-waste is generated globally which is increasing every day as the technology advances at a rapid rate. 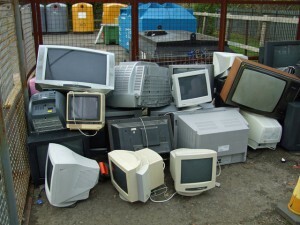 The e-waste comprises of computers, laptops, televisions and mobile phones most of which are easily processed for reuse or to extract materials from them. This process is known as e-waste recycling. The e-waste recycling process not only saves the eco-system from harmful toxics but it also supports the economy of a country in the form of generating a reliable source of employment. It requires a lot of manpower to carry out the recycling processes which promises reputable jobs to many skilled people and supports the economy. Without the e-waste recycling processes, most of the electronic waste is dumped in landfills which are not abundant in every country. As a result the scrap is required to be shipped to land dumps overseas which incurs heavy costs of management and transportation. The indigenous e-waste recycling facilities will not only save those domestic costs but will also reduce burden on the foreign country where the scrap was supposed to be dumped otherwise. There has been a lot of pressure form global environmental groups on electronics manufacturers. As a result, most of the manufacturers offer financial incentives to e-waste recycling facilities by buying the old electronics product that comes to them in large quantities. Also it helps in cutting the cost of raw material at the manufacturer’s end. As a result the cost of the final product becomes more affordable, rising the average standard of living of the masses. So this has far more than expected benefits to the consumers and manufacturers too. The e-waste recycling process also makes the scarce resources available to manufacturers that not only supports sustainable development but also reduces the burden on a country’s economy. This also averts the extraction costs in the form of mining and processing the extracted minerals and raw materials. The e-waste recycling process is much more energy efficient than the mining of the raw materials itself. This incurs less costs than that required to extract them from the Earth’s crust. This also leads to less pollution and less dependence on the already scarce minerals. The e-waste recycling can be a great business opportunity. There are not many e-waste recycling facilities available worldwide yet. You may be the one to initiate a facility in your city. This would earn you benefits in the form of both incentives and raw materials. It is a really great venture that is bound to prosper, especially if you are planning to start one in a developing country as these recycling processes are of more vitality in these budding nations which have both the resources and the manpower to make it feasible. The e-waste development sphere also has a huge scope of improvement. It provides a promising subject for industry and environmental research too. There is a prospect of many new projects that concern innovating efficient and more profitable recycling processes. It would require both finances and intellect which is bound to further strengthen the national economy. So now we know that besides the obvious environmental benefits of e-waste recycling processes, there are also many benefits in terms of financial and economic betterment of a nation. This make the e-waste recycling processes and facilities even more necessary worldwide. This will definitely act as a motivation for those who want to safeguard our eco-system and now they can benefit themselves from it too.